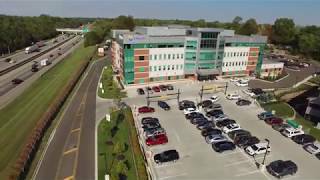 The TriHealth Kenwood medical office building includes a 4-story, 114,000 SF medical office tower along with a 2-story, 240-car parking garage. The tower is connected to the adjacent 2-story garage at the lower level with a combination of 15,000 SF of medical office space and 36-car parking spaces. This building replaces two existing buildings and is situated on the site to take advantage of the existing topography and visibility from I-71. The architectural style is a blend of traditional materials in a contemporary form. The exterior is composed of precast concrete with brick, metal panels, and glass and aluminum curtain wall. The design intent was to provide a unique style of architecture that would be timeless, yet iconic and highly visible from the highway both day and night. The project was completed at a cost of approximately $15 million. MSP and Oswald Company teamed with the Developer to prepare the concept design, take it through complete design development, process a major zoning PUD modification, and complete the design on a fast-paced schedule to deliver the project within the tenant’s timeline.